Our Frozen City Metropolis Pack comprises 1 each of the pre-painted resin casting packs - (SET01 to SET08) and 1 Flagstone Gaming Mat (FCB-09). This Metropolis has a free and exclusive giveaway which comprises of a Mound of Skulls and Skeleton Gibbet castings. This giant pack gives you the ability to build the ultimate ruined city for your Frostgrave adventures and utilising the various structures, statues, ruined doorways etc will allow you to enjoy and create various scenarios that feature in Frostgrave and it's supplements. 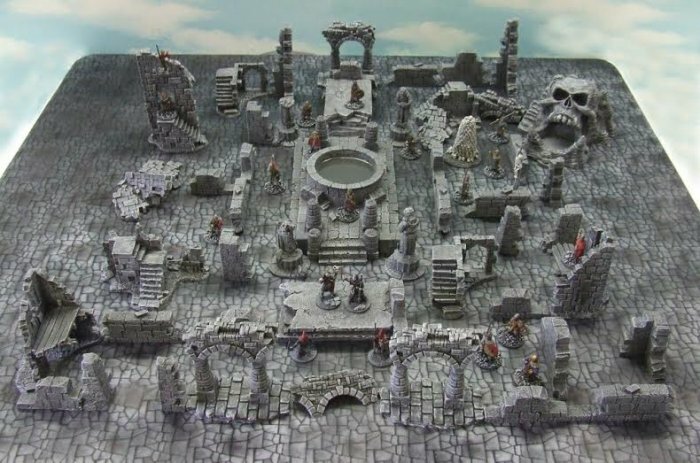 With it all coming pre-painted – you can set up your ruined city in minutes! This pack has a saving of £13 over buying the packs individually and you also get the exclusive free Mound of Skulls and Skeleton Gibbet!